Gask Ridge Map – The Gask Ridge is an early chain of frontier forts, watchtowers and fortifications built by the Romans in Caledonia (Scotland). The fort system was built around 80 CE along the Highland Line, the boundary between Scotland’s fertile lowlands and mountainous highlands. 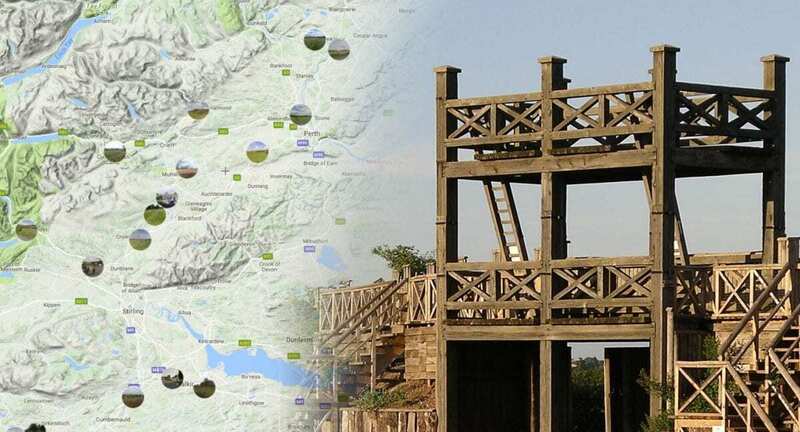 Beginning at Glenbank north of Dunblane and finishing at Bertha, the Gask Ridge was one of Rome’s earliest fortified land frontiers (Construction on Hadrian’s Wall wouldn’t begin for another 42 years). Recent archaeological evidence has even shown, that despite many of the forts on the Gask Ridge being rebuilt, sometimes twice, there is no evidence of destruction occuring through warfare. North of the Gask Ridge was a series of marching camps that the Romans constructed in the 1st century during their exploratory campaigning as far north as Inverness (and possibly further).